Members of the local First Peoples community. Chief of the Santa Rosa First Peoples Community of Arima Ricardo Bharath-Hernandez says the Indigenous Peoples have the right to the full enjoyment, as a collective or as individuals, of all human rights and fundamental freedoms as recognised by the Charter of the United Nations, the Universal Declaration of Human Rights and international human rights law. And on the eve of the recognition of the International Day of the World’s Indigenous Peoples tomorrow, Bharath-Hernandez appealed to all people of First Peoples descent, and those of other ethnicities, to join in advocating for the fulfilment of the rights of the First Peoples in TT in their positive movement for equality and development. This year’s theme is “Indigenous Peoples – Migrants and Movement”. The UN Indigenous Peoples Forum said, “Indigenous communities, peoples and nations are those that, having a historical continuity with pre-invasion and pre-colonial societies that developed on their territories, consider themselves distinct from other sectors of the societies now prevailing in those territories, or parts of them. The Santa Rosa First Peoples Community has direct links from the Encomienda system to the Missions. Arima was the last Mission to which the First Peoples from the remaining Encomiendas were placed to make room for the colonists. The Community is made up of several nations including the Lokono, Chaima, Yaio, Nepuyo, Carinepogoto, Chaguanes, Warao, Tamanapogoto and Araucas. The Santa Rosa First Peoples Community could trace its lineage to pre-Columbian periods. He said it has been historically proven that under British rule, the First Peoples of the Arima Mission were displaced when they lost 1,320 acres allocated to them by the Spanish Government when migrants came to these shores. They have been given some redress in some ways, including the restoring of 25 acres of land to the Santa Rosa First Peoples Community, for the establishment of a First Peoples Heritage Village. 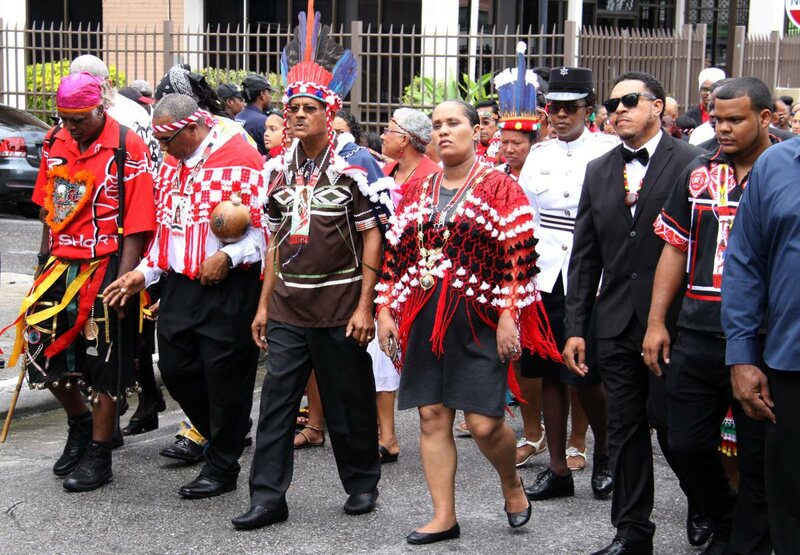 He said a major challenge facing the First Peoples of TT was the question of whether or not they were “pure bred”. The chief reiterated their call for the reburial of the human remains unearthed at the Red House site in 2013 and 2014. They were confirmed to be those of people who lived in Trinidad and parts of Central America during the period AD 990 and AD 1400. Chief of the Santa Rosa First Peoples Community in Arima, Ricardo Bharath-Hernandez, says the indigenous peoples have the right to the full enjoyment, as a collective or as individuals, of all human rights and fundamental freedoms as recognised by the Charter of the United Nations, the Universal Declaration of Human Rights and international human rights law. And on the eve of the recognition of the International Day of the World's Indigenous Peoples tomorrow (Thursday), Bharath-Hernandez appealed to all people of First Peoples descent, and those of other ethnicities, to join in advocating for the fulfilment of the rights of the First Peoples in TT in their positive movement for equality and development. Reply to "‘Pure bred’ question upsets Carib chief"